The sixth Krasnoyarsk Economic Forum may be remembered for pithy metaphors. "Government, business and society can be likened to three soldiers trapped in a well. They can climb out by pressing their backs against each other, but they may instead stab each other in the back. This is a crisis of confidence," said analyst Dmitry Badovsky. "Before we press our backs against each other, we should turn to face each other and agree on a plan," added Sergei Alexashenko, director of macroeconomic studies at Moscow's Higher School of Economics, who chaired the debate. Ex-governor of the Krasnoyarsk region, Valeriy Zubov, used yet another metaphor: "There is no point in repairing an old fortress; it is better to build a new house." This sentiment encapsulated an idea echoed by many speakers: the pre-crisis economic system has outlived it usefulness and there is no point restoring it. 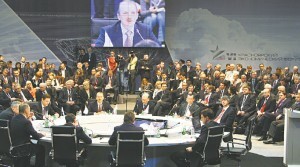 The forum, among the first federal-level discussion of the crisis, was notable for its down-to-earth approach. "Nobody is interested in reflecting on causes and who is to blame. The main task is to form a bank of ideas on how to overcome the crisis," said Alexashenko. The main topics during the two-day discussion were "The role of the state in the economy: a strategy for Russia" and "The state and business: an action program." About 500 specialists in economics, government administration and business took part. Business made many familiar proposals to stimulate the economy—including cutting taxes, reducing government red tape, cutting import duties, energy saving and fixing energy tariffs. As no coherent medium-term strategy exists, both the authorities and businesses continue to "play it by ear." "So far the authorities have been ad-libbing. There is no active policy," presidential aide Arkady Dvorkovich admitted. Major companies do not challenge that. To quote the president of Norilsk Nickel, Alexander Voloshin, "Business should think about profits, and it is the duty of the state to use economic methods to stimulate employment in the most promising sectors." "The biggest danger," continued Voloshin, "is greater state interference with the economy. Everybody is ready to criticize the market, but the market is definitely more effective than any government. Bureaucrats should not be allowed to stage a comeback." A recurring theme at the forum was the need for government to splurge on infrastructure, above all transportation, along the lines of the "Obama plan" or Roosevelt's New Deal. "Housing construction is key," said Dvorkovich. It has the biggest multiplication effect: it solves the twin task of stimulating growth and of improving quality of life." There were also proposals to rethink National Priority Projects. In fact, Vice President Alexander Zhukov proposed adding two more national projects: "Information Society" and "Energy Efficiency". A bank of anti-crisis ideas has been created, but it remains to be seen how these ideas will be implemented. The traditional recipes (cut taxes and administrative pressure, build more, etc.) go only so far and will eat into government resources. "People dissociate themselves from the government. That is why they ask it for help," said Nikita Belykh, Governor of the Kirov Region. But it is the state that requires the people's help. It certainly needs their trust. Otherwise everyone will remain at the bottom of the well. The main outcome of the discussion was that it brought business, government and society closer together and generated some sound and interesting ideas. It is important to put these ideas into practice. We have found that you cannot solve the problem by throwing money at it. Other mechanisms and regulations should be used, so some difficult and painful decisions may have to be made. The Ministry for Economic Development predicts an inflation rate of 13-14 percent. That is plausible, but there is a risk that it will go as high as 15 percent or more. Bureaucrats in all countries are trying to stage a comeback. They refuse to admit that government regulation has been wanting. They say there was too little of it and want to increase it.